The 5ive Star Gear GI Spec LC-II Suspenders are built to U.S. Military specifications, making them essentially identical to the ones worn by active service members. Made from high-strength nylon, the suspenders guarantee lasting durability needed to withstand daily use in hostile environments. They are designed to hold up belts loaded with holsters and accessories. If necessary, they are tough enough to drag a downed soldier out of danger. 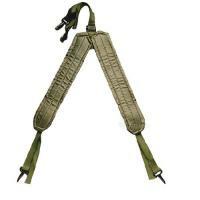 The suspenders feature wide straps to effectively distribute weight loads and prevent slipping. Metal clips loop through holes in army-issued pistol belts or other similar designs for secure attachment and comfortable wear. Works better than the expensive suspenders being sold.